Coffee County High School football players carry their teammate across the field. His final wish was to go through the tunnel leading into his high school’s football stadium with his team one last time. 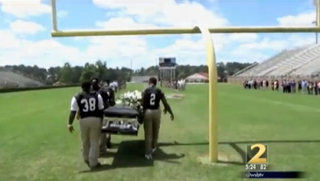 Coffee County High School football players honored their teammate Malik Sparkman’s dying wish and carried the talented linebacker’s coffin through the tunnel and across the field to the end zone, WSB-TV reports. According to the station, the celebration, which was held at the Douglas, Ga., high school on Sunday, included more than 500 friends and family who showed up for the final goodbyes. His teammates remained stoic up until a video showing the star athlete started playing, reducing some to tears.